South Korean Byul Yun (19 years old) won a silver medal in the boys junior classical division, as well as a gold in contemporary. He dances here with Hee-Won Cho in Don Quixote. Photo by Pat Bromilow-Downing. 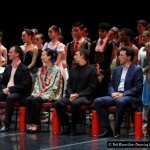 The panel of judges for the 4th South African International Ballet Competition were, seated from left, Dawn Weller, Ernst Meisner, Xin Lili, Julio Bocca, Oliver Matz and Melanie Person, along with the chair of the panel Hae Shik Kim (not shown). Photo by Pat Bromilow-Downing. 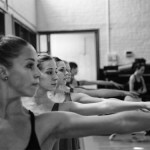 17 Year old South African, Khanya Mandongana, receives a scholarship to the Ailey School in New York from co-director of the school Melanie Person. Photo by Pat Bromilow-Downing. 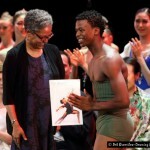 South African Mthuthuzeli November (20) receives a scholarship to the Ailey School in New York, presented by the school’s co-director and judge of the South African International Ballet Competition, Melanie Person. Photo by Pat Bromilow-Downing. 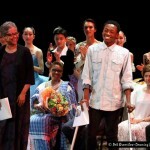 One of the audience favourites, young Leroy Mokgatle from Johannesburg receives his medal to excited applause. Photo by Pat Bromilow-Downing. The emotional senior men’s winner, Ramiro Samón, receives his gold medal from Minister Connie September (MP Department of Human Settlements). Photo by Pat Bromilow-Downing. Young Chinese ballet stars-in-the-making, from left: Yu Hang (14 years old), Xu Jing Kun (13) and Fu Yi Yang (13). Photo by Pat Bromilow-Downing. Gold medallist ballerina Yuanyuan Zhang with partner Anpu Yuan (both from China) during the finals of the 2014 South African International Ballet Competition. Photo by Pat Bromilow-Downing. South Korean Dae-Han Na with girls senior classical gold medallist Ga Yeon Jung in their Don Quixote variation. Photo by Pat Bromilow-Downing. Girls junior classical gold medallist Yuanyuan Zhang dancing Grand Pas Classique with partner and senior finalist Anpu Yuan, both from China. Photo by Pat Bromilow-Downing. 15 Year old Seung Yeon Yang from South Korea won the silver medal in the scholar classical division. Photo by Pat Bromilow-Downing. 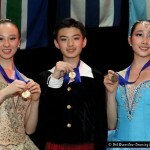 Xu Jing Kun from China (13 years old) took gold in the scholar classical division with his variation from La Sylphide. Photo by Pat Bromilow-Downing. Golden girl, Yu Hang from China (13 years old), took home two gold medals in her scholar division for classical (as seen here in La Esmarelda) and contemporary. Photo by Pat Bromilow-Downing. Senior finalist Bit Ha Na Kim (20 years old) from South Korea dances a sparkling variation from Sleeping Beauty. Photo by Pat Bromilow-Downing. 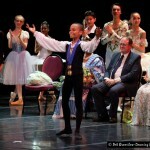 Cuban Francois Llorente Nunez (18 years old) wowed audiences with his elevation in his variation from Diana and Actaeon and took home the bronze medal in the junior classical division. Photo by Pat Bromilow-Downing. 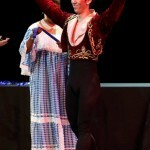 Rafael Quenedit Castro (17 years old) from Cuba took gold in the boys junior classical division for his strong variation from Don Quixote. Photo by Pat Bromilow-Downing. Geng QingQing (aged 18) from China performed her contemporary piece entitled “Offering Dance” during the finals of the 2014 South African International Ballet Competition. Photo by Pat Bromilow-Downing. Winning a silver medal in the senior classical division, Javier Monier (21) from Cuba gave a sensational performance from Diana & Actaeon with his multiple pirouettes and big jumps. Photo by Pat Bromilow-Downing.